↑ अ आ इ Wade, Nicholas (29 June 2007). 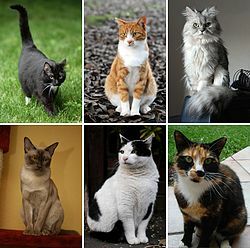 "Study Traces Cat's Ancestry to Middle East". New York Times. New York: NYTC. अभिगमन तिथि 2 April 2008. ↑ "Meet Helen and Aphrodite, Cyprus's Indigenous Cats". China Daily. 3 नवंबर 2009. अभिगमन तिथि 3 November 2009. ↑ "Oldest Known Pet Cat? 9500-year-old Burial Found on Cyprus". National Geographic News. National Geographic Society. अप्रैल 8, 2004. अभिगमन तिथि मार्च 6, 2007. ↑ Nie, W.; Wang, J.; O'Brien, P. C. (2002). "The Genome Phylogeny of Domestic Cat, Red Panda and Five Mustelid Species Revealed by Comparative Chromosome Painting and G-banding". Chromosome Research. 10 (3): 209–222. PMID 12067210. डीओआइ:10.1023/A:1015292005631. ↑ Sewell, A. C.; Haskins, M. E.; Giger, U. (2007). "Inherited Metabolic Disease in Companion Animals: Searching for Nature's Mistakes". Veterinary Journal. 174 (2): 252–259. PMC 3132193. PMID 17085062. डीओआइ:10.1016/j.tvjl.2006.08.017. ↑ Abby Ellin (5 October 2008). "More Men Are Unabashedly Embracing Their Love of Cats". New York Times. अभिगमन तिथि 30 August 2009. ↑ Jones, Jeffrey M. (30 November 2007). "Companionship and Love of Animals Drive Pet Ownership". Gallup, Inc. अभिगमन तिथि 30 August 2009. ↑ Mason, I. L. (1984). Evolution of Domesticated Animals. Prentice Hall Press. आई॰ऍस॰बी॰ऍन॰ 0-582-46046-8. ↑ Geyer, Georgie Anne (2004). When Cats Reigned Like Kings: On the Trail of the Sacred Cats. Kansas City, Missouri: Andrews McMeel. आई॰ऍस॰बी॰ऍन॰ 0-7407-4697-9.